First foreclosures, and now, sadly the sagging economy has hit a local business in Montecito Heights (that is 1 out of the total 5 in town). 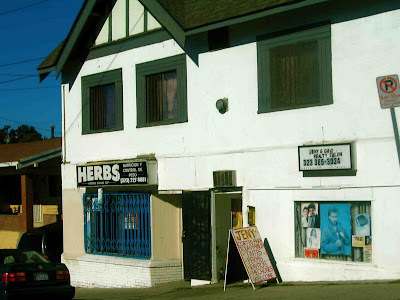 The Chinese Herbs place has gone on to greener pastures. I maybe saw that place open only a handful of times. But, I won't miss the "Sexual Viagra" flashing neon sign in their window all night. Made this little town ugly. So who'll move in behind those lovely blue bars? 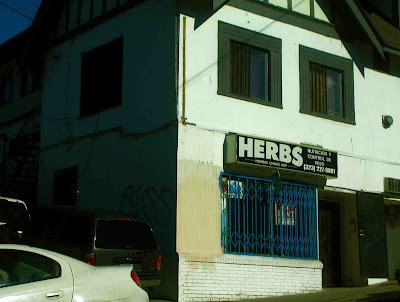 Another herbs place? A bike shop? Maybe a pizza joint! Either way you would get a good neighbor in Jeny's hair salon and of course the nice people at Rodriguez's Market. And you know the Aves got your back. I used to take piano lessons from a lady in that very same storefront! She had a really big smelly dog and was an obvious pack rat. The entire space from the back of her piano to the end of the room was filled with her beloved junk. Wonder if anyone else took lessons from her? Thanks for the lovely blog. It always brings me back to when I attended kindergarten and 1st grade at Latona Elementary. SO cool, thanks for that info. Did she only give piano lessons or was the store for something else too? ever noticed the crazy hobo lady on the corner? if you come up on ave 43 to turn right onto griffin, she's usually on that corner and will come right up to your car and stick her hands/head inside to panhandle. she scared me the first couple times but now she knows better than to even come near. Ha. She scared the crap out of me the first time too. I thought she was injured or needed help. Now I don't fall for it anymore. "Did she only give piano lessons or was the store for something else too?" I think the piano lady lived there actually. There was a couch in front of the window that faced in toward the piano bench. The piano in front of that, and just junk/trash from there to the back wall. Her situation was a bit sad from what I remember. She, her dog and her place were always a bit dirty, and she seemed lonely. Don't remember if she did anything beside teach piano. A Starbucks would be great on that corner. right. a starbucks. brilliant. fits right in with the neighborhood vibe.